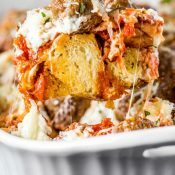 My most requested recipe! Overnight French toast flavored with a touch of orange liqueur that's baked casserole style on a bed of homemade caramel sauce. 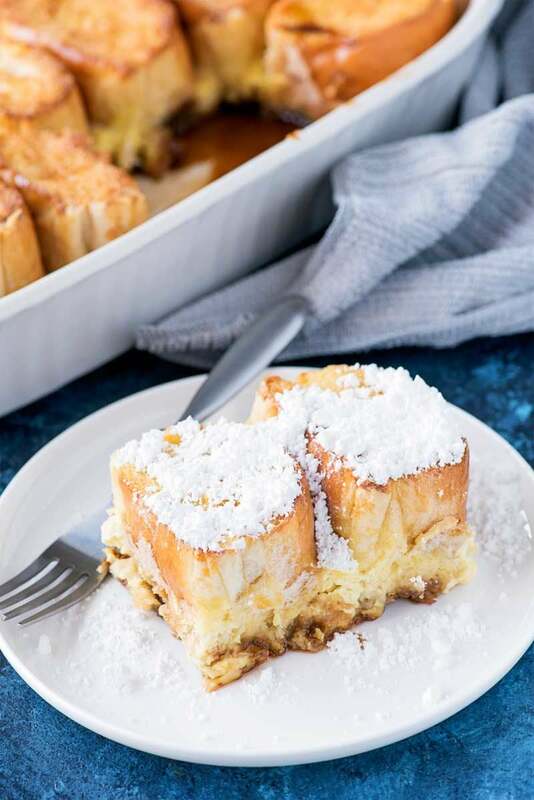 Out of all the recipes I have ever made, this creme brulee french toast casserole recipe is the most requested one by far. It gets it’s name from having a crunch top (as you see in the photo – the tops of the bread are rich golden brown) and the insides have the traditional “softness” of french toast. I used to bring this in for the rotating “breakfast club” at work, as it was the only thing that was simple to make and good enough to risk my reputation on. I’d make 3 full dishes of it and almost nothing would be left by the time lunch rolled around. By the end of the day, I’d have people begging me for a copy of the recipe. And really, I can’t blame them – this is easily one of my top ten recipes, too. Because not only is it easy to make, but it’s also an overnight french toast, which means it gets even better if the French bread is allowed to soak for about eight hours. 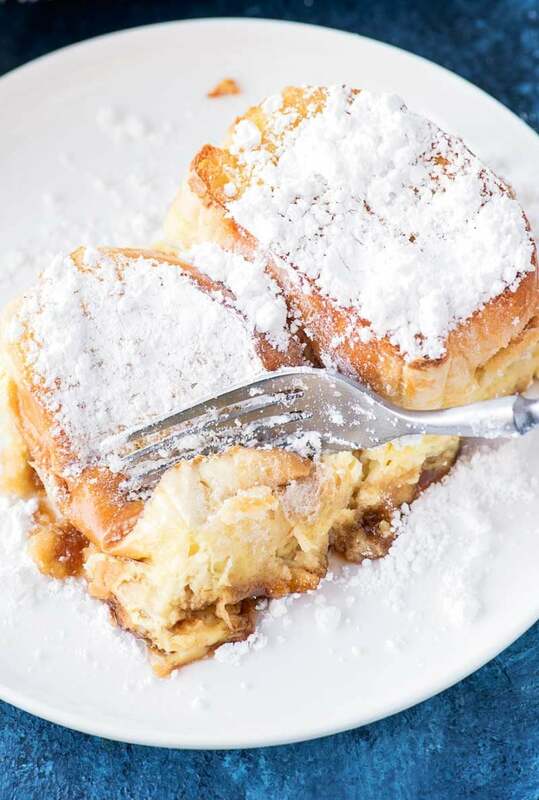 And if you don’t have that kind of time, that’s okay, too – I’ve made this creme brulee french toast from start to finish in a single morning and it still tasted wonderful. 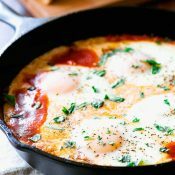 Now, for me, “good” breakfast foods typically have the same characteristics: they’re easy to make and easy to clean up. 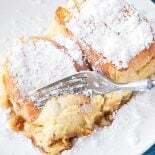 And before I stumbled across this french toast casserole, that’s where my long term affair with French toast ran into trouble. Making traditional French toast is a messy event, because inevitably you will get that egg mixture all over you, the counter, and those all those tricky places to clean on your stovetop. Traditional French toast also takes forever, because unless you own a two-foot frying pan you can only cook two (maybe three) slices of bread at a time. And I don’t know about you, but I’m never satisfied with “just” two slices, so I usually end up going for four or six.. which, of course, means the first two slices are cold by the time my plate is full. Plus, this also means three times the messy counter, three times the boredom of waiting for the bread to brown, and three times the frustration of failed, falling-apart flips because of course I made too much egg mixture but don’t have nearly enough bread so I’m drenching every piece so not to waste it and it all becomes a heavy, soggy mess. I just want to love you, french toast, but you make it so hard on me. This is why I was absolutely elated when I discovered that you can bake french toast in a fully contained baking dish. That means no frying pan, no dripping bread, no sticky mess. And when you add in the fact that you can make it the night before to be ready to pop in the oven first thing in the morning? The only challenge you have left is, well… not miss the oven when you put the dish into cook. Which, okay, may be tricky to do first thing in the morning, but don’t worry – I have complete faith in you. The recipe is ridiculously easy and tastes just as good (if not better) than traditional french toast. I think this was one of the first dishes I made from scratch for anyone other than my immediate family, and certainly the only dish I’ve ever made for 10+ people. However, as much as I love the simple taste of this recipe, I can’t take full credit for why it’s so darn good. I think the majority of its success comes from my “secret” ingredient: Jimmy John’s day old french bread. It’s only $0.50 a loaf and when sliced into two inches, it makes perfect, individual-sized portions in the casserole dish. I truly hope you have a location near you, because their sandwiches are amazing, and I think a big part of that is due to their delicious French bread. I typically get subs for dinner and pick up the day-old bread so we’ll have breakfast in the morning. 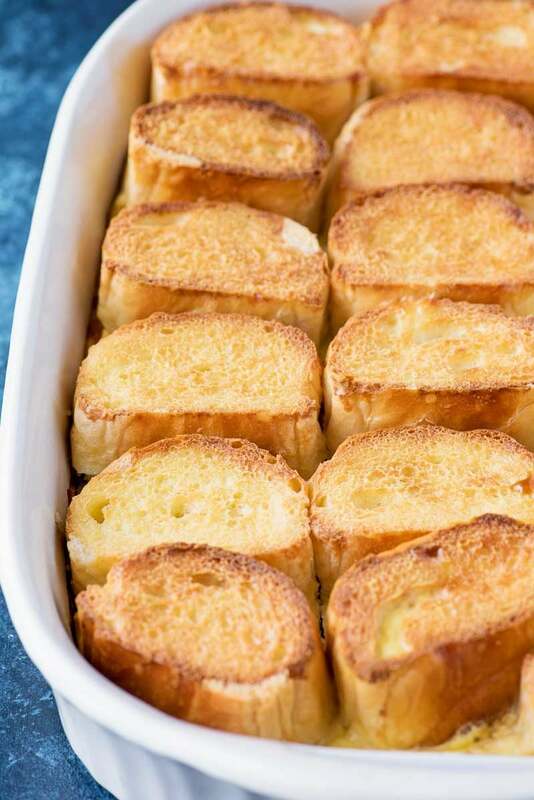 Can this french toast casserole be made in advance? In fact, this recipe is designed to be an overnight french toast, so all of the ingredients are mixed the day before, then covered and chilled overnight before baking the next morning. However, this step is totally optional. There have been plenty of times when I’ve made this creme brulee french toast from start to finish, with no resting overnight, and it still turned out delicious. I highly recommend using Jimmy John’s French bread for this recipe (whether it’s fresh or day old), but if you don’t have a location near you, any French bread you can get your hands on will work just as well. For the orange liqueur, I’ve used both Grand Marnier and Cointreau. Both were delicious! If you like this recipe, be sure to check out this one for Classic Strawberry Stuffed French Toast! This post was originally published on September 2nd, 2014. It was updated with new pictures and revised recipe instructions on June 8th, 2017. Cut the french bread of your choice so that it will sit about 2 inches high in a 9x13 baking dish. Set bread aside. In a large bowl, whisk eggs together until yolks are broken up. Add in half and half cream, vanilla, orange liqueur, and salt, then stir until fully combined. Set bowl aside. Melt the butter in a saucepan over medium heat. Add the brown sugar and corn syrup, stirring until sugar is dissolved, about 3 minutes. Remove caramel sauce from heat and immediately begin to pour in a 9x13 baking dish. Pour slowly so that bottom of baking dish is completely covered with caramel. See above video for example. 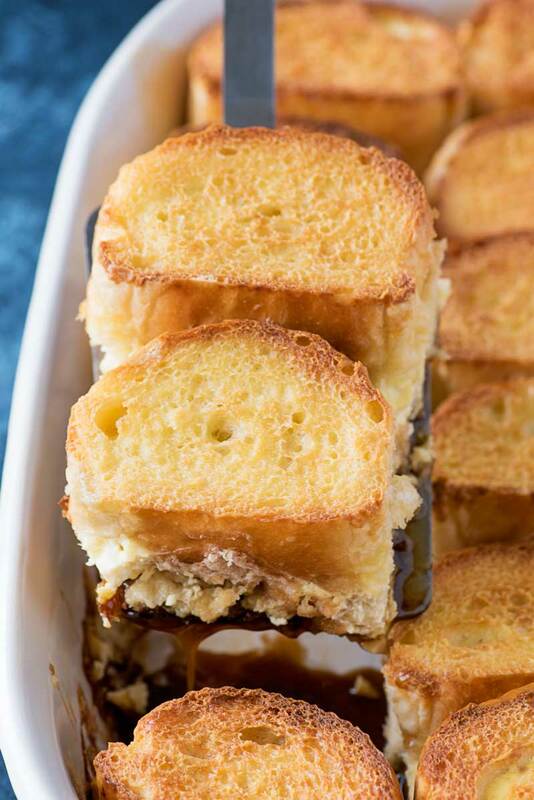 Arrange cut french bread in baking dish on top of the caramel. Bread should be tightly packed with minimal space in between. Pour egg mixture over bread, saturating each piece as much as much as possible. Cover baking dish and place in the refrigerator over night (ideally for at least 8 hours). Set oven to 350 degrees. Bake for 35-40 minutes or until bread is puffy and the top is golden brown. Wait 5 minutes before serving. Add powdered sugar as desired (optional). You have to try it. So delish. I make it weekly now for a forced breakfast with Mom, minus handheld devices. Best stuff ever!! I remember when you made it for me. 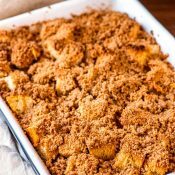 I love overnight French toast casseroles too! My husband loves creme brûlée, so I’m thinking this is going to have to go on the rotation! This looks seriously amazing! Can’t believe I’m saying this, but I’ve never had a French toast casserole. YIKES!! Most of the time they look so blah, but not yours. I’m definitely missing out. This looks amazing and I for one will be trying it. One question, do you think orange extract would work in place of the orange liquor? I too buy jimmy johns day old bread all the time. I often will make my own sandwiches with it, buying my own meat and toppings. I’ve even stuffed it with seafood salad, bread and butter pickles, and tomato slices which is an amazing sandwich. It also makes a quick and delicious garlic bread. (Butter followed with a generous sprinkle of garlic granules with a light sprinkle of kosher salt. Throw it in a toaster oven at 350 for 2 min, followed by broiler until golden brown.) I have gone through the window and asked for 8 loaves of their day old bread before and they usually ask at that point what I will be using it for. (They want to make sure I’m not a business that is using their bread.) Just tossing it to my starving children! 😉 I will take the bread home, cut them in half and store them in gallon ziplock bags. They keep for 4-5 days at least and the kids can make sandwiches whenever they want for lunch. What’s the longest you’ve left this in the fridge before cooking? Do you think 15ish hours would be too long? I can see why it’s the most requested…I just discovered it and already I can’t get it out of my head! Looks incredible. I love Creme Brûlée and French Toast so this looks incredible! Will need to cut the recipe in half since I live alone! How would you handle leftovers? When do you get the day old bread at JJ’s. First thing in the mornings or as they close. I didn’t know! 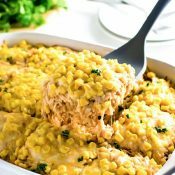 I have this casserole made and in the frig for tomorrow morning. Can hardly wait to try it! Hey, Carol! I tend to go in the evenings for the day old bread, but technically, they should have some first thing in the morning, too. If you go at the end of the night you can also buy any fresh bread they baked that same day, but it’s a little more expensive. But any french bread will do 😀 I hope the casserole turns out amazing! Do you leave it covered when you put the casserole in the oven? OMG! Made this xmas eve and baked it xmas morning. Was not complicated at all. Unbelievably decadent. One of the most delicious dishes I’ve EVER tasted. HIGHLY RECOMMEND.